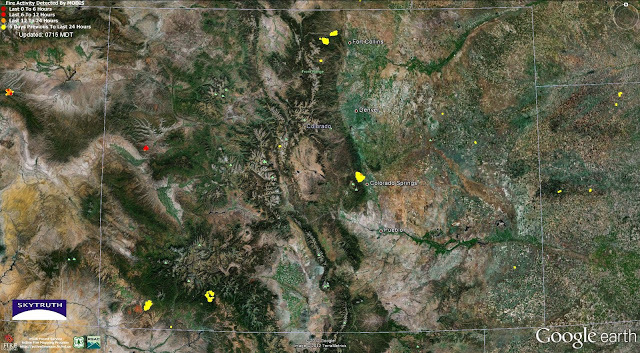 Map of Colorado showing active fires (red and yellow patches) detected by satellite sensors on June 27, 2012. Source: US Forest Service – Active Fire Mapping Program. Of course, there are also tens of thousands of oil and natural gas wells in Colorado. 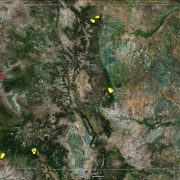 The red spot in western Colorado on the map above caught our eye. That’s the new Pine Ridge fire, and it happens to fall within the Piceance Basin, one of the nation’s most active natural-gas plays. Gas drilling with hydraulic fracturing (fracking) took off here in the 1980s and has been booming ever since. Zooming in on the Pine Ridge fire (below), we’ve plotted active oil and gas wells as blue dots. This is old data we collected way back in April 2008, so there are probably additional wells in the area now that we’re not showing. Look closely at the imagery in Google Earth or Google Maps and I’ll bet you can see a few. 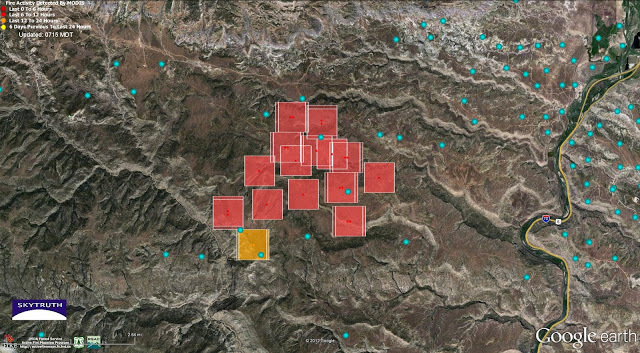 The red and orange squares indicate active fire detections from MODIS since 7:45am MDT yesterday. That means fire was burning somewhere within each square, but not necessarily covering the whole colored area. We don’t know what happens if a wildfire burns in close proximity to natural gas wells and pipelines (got any stories you can share with our readers?). Vegetation should be regularly cleared away from those facilities so they’re not endangered. The web of access roads might even make it easier for fire crews to get to the scene. But the presence of wellheads, pipelines, compressor stations and processing facilities that demonstrably leak explosive and flammable natural gas might add some risk to the fire-fighting effort. As drilling spreads across Western lands, the intersection of wildfire and gas infrastructure will become increasingly common. Let’s tighten up that leaky infrastructure to save energy and money, cut pollution, and — quite possibly — save lives and property. Closeup of Pine Ridge fire about 15 miles northeast of Grand Junction, Colorado. Colored squares indicate active fire detected within past 24 hours (June 27, 2012). Blue spots are locations of active oil and gas wells as of April 2008. Glad to see others are also blogging about the gas mining boom that has suddenly taken off in this country and around the world. Living in the epicenter of a shale gas extraction zone in the heart of the Barnett Shale made me wonder how people are in Colorado with the wildfires burning. As you know, gas is explosive, so one can't help but wonder if all the gas and oil wells are 'adding fuel to the fire'. Thank you for covering this current event, and hoping you all stay safe. Wells being drilled as well as producing wells have safeguards to be able to weather a fire. My question would be at what point do they evacuate the personnel working on well sights at this moment. A lot of those areas are difficult to access, most with one way in and out. Kind of scary! Yeah, I'm more concerned about the possibility of fire from fugitive emissions and leaks than the wells themselves going kaboom. I also wonder if the operators have shut in those wells, or if they continue to produce gas even though fires and response personnel are in the vicinity. And getting everybody out of there is certainly the top concern. Those fires can pick up and move really fast.